The story of the Very Hungry Caterpillar’s metamorphosis into a beautiful butterfly. This is a Sensory Friendly performance. 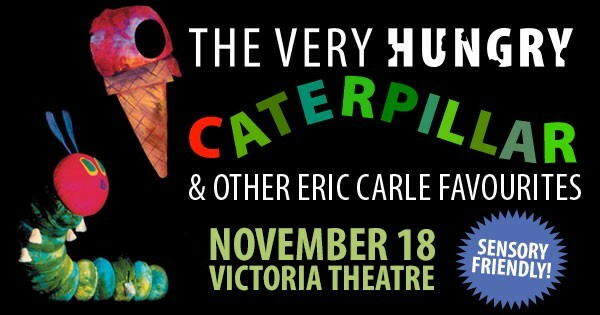 THE VERY HUNGRY CATERPILLAR AND OTHER ERIC CARLE FAVOURITES includes the story of the Very Hungry Caterpillar’s metamorphosis into a beautiful butterfly; the fanciful account of Little Cloud’s travels through the sky; and the Mixed-Up Chameleon’s discovery of his own unique nature all in mesmerizing and innovative black light puppetry. This production is great for all families, especially for children with an autism spectrum disorder, sensory sensitivity, and other special needs. It is our hope that this production will make attending the theatre an accessible and enjoyable experience for all.? Find more events like "The Very Hungry Caterpillar and other Eric Carle Favourites"